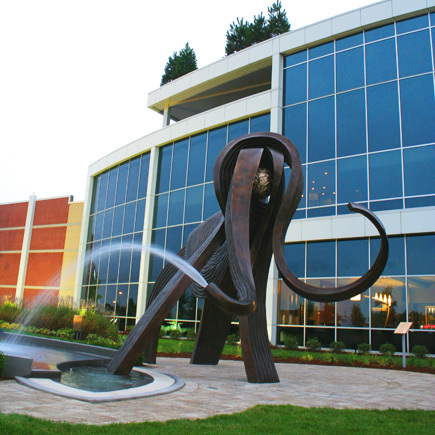 I created this sculpture/fountain especially for the corporate headquarters of Soprema, located along the TransCanada Highway (route 20) in Drummondville, Quebec, Canada. The sculpture is made up of three separate bronze elements which fit together in a complex arrangement, united around a fourth element: a sphere, the cornerstone of the sculpture and spirit of Soprema. The Mammouth Spirit IV, 2010-2011: Bronze, 4 elements, 15 x 21 x 13 feet (4.5 x 6.5 x 4 metres). The biggest bronze sculpture in Canada. Forged at the Fonderie d'art at Inverness. Three bronze elements which, in a complex arrangement, are assembled around a fourth, spherical... the cornerstone of a synergy that exudes strength and vitality. The reflection of Soprema, a company that has built itself collectively for more than a century and whose spirit of innovation is at the core of its success. It is, moreover, the company's values – respect, integrity and concern for the environment – that motivated the artist to create this sculpture to be a worldwide reference, a reflection of Soprema in its field of endeavour.